I interviewed Laura Gómez for the Borderlands History Interview Project late last year, but had been waiting for just the right moment to release the interview. In celebration of Women’s History Month and within weeks of the 170th year anniversary of the signing of the Treaty of Guadalupe Hidalgo, March was just the month. In fact, with my co-contributors, we decided we would dedicate this week to celebrating Dr. Gómez and her scholarship. With the recent political focus on Trump’s border wall and his venomous rhetoric against undocumented immigrants—the racially bound “Mexican menace”—Dr. Gómez’s landmark book Manifest Destinies: The Making of the Mexican American Race is more important now than ever. Recently, she spoke at the University of Texas at El Paso to commemorate the second edition of her groundbreaking book and to talk with students, faculty, and community members about its significance. Last Monday, Blanca Garcia-Barron reported back about her experience at the talk for the Borderlands History Blog. It is in the spirit of understanding the legacy of Mexican-American racialization and in celebrating the women scholars who have worked tirelessly for decades to recuperate and expose this history that I would like to present my interview with Dr. Gómez. Her insights on race, racism, Mexican-Americans and law reveal the power of her research in the era of Trump. Currently, Laura Gómez is Professor of Law at the University of California, Los Angeles where she teaches Civil Procedure and Criminal Law in the first-year UCLA School of Law curriculum and has taught courses in law and society and the Critical Race Studies Program in the law school’s upper-year curriculum. She received her A.B. at Harvard College in 1986, and then went on to earn a Master’s degree and Ph.D. in Sociology from Stanford University, in 1988 and 1994 respectively. As she worked toward her Ph.D., Gómez obtained a J.D. from Stanford University’s School of Law in 1992. She has written and edited several books including: Misconceiving Mothers: Legislators, Prosecutors and the Politics of Prenatal Drug Exposure, published in 1997 by Temple University Press; Manifest Destinies: The Making of the Mexican American Race, first published in 2007, New York University Press. (Celebrating its 10th Anniversary NYU Press is ready to release the second Edition of the book in 2017), and Mapping “Race”: Critical Approaches to Health Disparities Research, Co- Edited (with Nancy López), published in 2013 by Rutgers University Press. She has written numerous articles for scholarly as well as general readership about race and the law. Professor Gómez has had extensive experience outside of academia as well. As a law clerk for Judge Dorothy W. Nelson on the Ninth Circuit Court of Appeals (1992-93) and later as a legislative aide to U.S. Senator Jeff Bingaman of New Mexico (1996-97), Gómez’s portfolio included Central American policy, South African policy, and Armed Services (for the latter, she held a top-secret government clearance). While Laura Gómez is the first “non-historian” I interview for the BHIP, her research has done so much to advance the work of Chicanx and Latinx historians and scholars across fields in understanding the racialization of Mexicans in the United States. Indeed, her work has been foundational in complicating the black-white racial paradigm in the U.S. and providing the history of the legal framework used to racialize Mexicans and Mexican Americans. Her book outlined the genesis of Mexican-American racial formation beginning in the nineteenth century and has allowed for relational discussions for other Latina/o history in this country. With her diverse academic background in law and sociology, I asked Professor Gómez how she approached her research for this book. She explained that as she worked on her Ph.D. in sociology and her law degree concurrently, she was very much thinking about the ways in which critical race theory and the law could be applied to understanding the history of Mexican-Americans in a state like New Mexico. Gómez stressed that the questions she asked drove her to search for answers in different fields and with the support of thoughtful advisors she was able to weave together methods and theories from sociology, anthropology, law and, of course, history in order to address the overarching political scope of her study. In many ways Manifest Destinies is about contesting and complicating established historical narratives in the United States. Describing the North-South/black-white paradigm that has characterized nineteenth century racialization, Dr. Gómez stated that in her book she sought to complicate this narrative by foregrounding the connections between the U.S. war with Mexico that started in 1846 and the tensions that led to the Civil War fifteen years later. Gómez wanted to reorient the story of race-making in the United States to include the invasion of Mexico and the “uneven incorporation” of Mexico’s territories and its people into the United States after 1848. Moreover, she underscored the manipulation of the narrative of westward expansion—powerfully enshrined in the ideology of Manifest Destiny—that she explained shrouds this historical moment in invisibility. One, westward expansion is depopulated, but for the white settlers coming from the east, Native communities and Mexicans are erased. Second, the violence of the war and the expropriation of land is also unceremoniously removed from history books, making westward expansion seem inevitable and ordained for white Americans. Our conversation continued from there to discuss the current situation in the United States and why the second edition of her book will be flying off the shelves. Laura Gómez is thrilled that her book continues to be salient today—especially in the Trump era. We must “seize this moment of reactionary politics” she said, because the numbers are in our favor. Latinx are a young and growing population and we must be ready to expand our educational horizons in order to push back against this president’s agenda and the conservative forces feeding it. Her current project will certainly help with this as she is writing about the racialization of Latinx in the twenty-first century United States. It was a fantastic conversation with Dr. Laura Gómez and I encourage our Borderlands History Interview Project audience to enjoy the entire interview via this link. Thank you again for joining us and we look forward to a new episode of BHIP soon. Special thanks to Marko Morales for the great work with audio editing and to Mike Bess for some additional technical support. 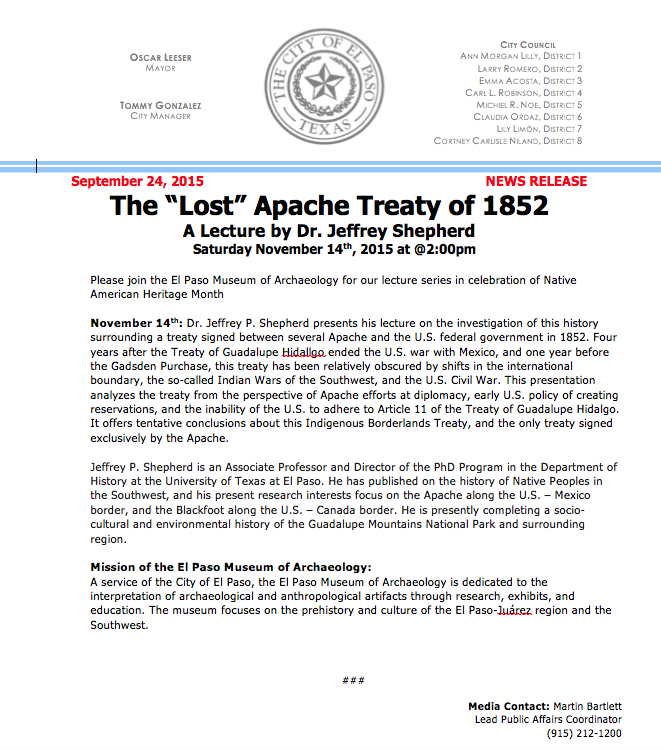 Lecture on The “Lost” Apache Treaty of 1851, November 14, 2015 at 2 p.m.
You are invited to attend a lecture by UTEP Professor Dr. Jeffrey Shepherd on the “Lost” Apache Treaty of 1852, on Saturday, November 14, 2015 at 2 p.m. at El Paso Museum of Archaeology. FREE.